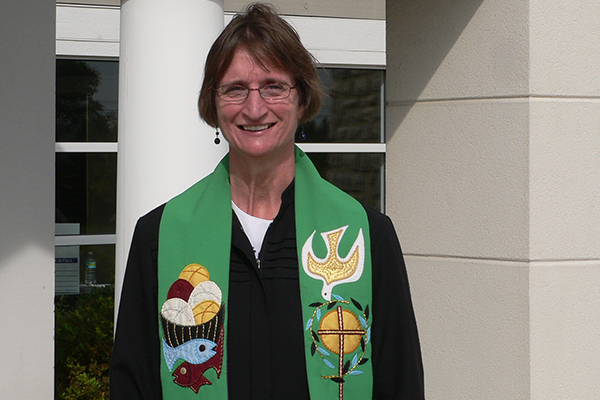 Sigrid Rother is a German pastor serving as minister in a UCC congregation in Ohio. President Donald Trump is splitting American church congregations. Some support his policies while others protest against them – such as the United Church of Christ (UCC). During a recent visit to Germany Sigrid Rother, a German pastor serving as minister in a UCC congregation in Ohio, spoke about the concerns of liberal Christians. Together with 24 members of your UCC congregation you have spent 10 days visiting partner churches here in Germany, including the diaconal work in Rhineland-Westphalia-Lippe (RWL). This has involved a lot of discussions about the welfare state in Germany and about aid for refugees. With regard to this do you see the Germans as setting an example for your own church? Many of our members have been very impressed by what Germany is doing for the integration of refugees. They were equally impressed by the wide extent of diaconal social work that is given strong support by the State. On the other hand they found it strange that the German State helps to fund social work through the taxation system. That is precisely what Americans do not want. The separation of Church and State is very important to them. Many people insist that they don’t want to hear about politics during worship. This negative attitude is to do with their history. The Reformed Church Christians who emigrated from England were in conflict with the Established Church at the time and that is why they fled to the New World. This experience of conflict became the constitutive basis for the separation of Church and State which is guaranteed in the American Constitution. This separation of politics and religion has led to the churches being hesitant to take up political positions. How has the UCC dealt with this since the election of Donald Trump? The UCC has always been a politically active church. We count ourselves among the most liberal religious communities in the USA. We are only a comparatively small Protestant Church with 1.5 million members in around 6,000 local churches. But we were the first to have a black minister in 1785 and the first woman minister in 1853, and now we are the first of the larger churches to make a declaration on equal rights for homosexual partners. We are opposed to the death penalty and are involved in human and environmental rights as well as with social justice. Since Donald Trump became President the UCC has taken a clear position against his policies. We called on people to join the protest marches as soon as he adopted his entry ban on Muslims from certain countries. Many local churches in the USA are split. One section of the congregation voted for Donald Trump whilst another section was clearly against him. What is the situation in the UCC congregations? Most congregations do not agree with his politics and are now very concerned about how our country will develop under his government. That is the case for me and a section of my own congregation. Yet in our own church in Westerville there are also some members who voted for Donald Trump and who are particularly hopeful that he will create new jobs and that he will make the white Protestant America of the fifties “great” again. In this respect, as pastor, I hold back from expressing political views. Our UCC church sees itself as a family church, in which conservative middle-class families have their place just as much as liberal single-parent families and homosexual couples with adopted children. But the 600 members of my congregation, which I have led for 15 years, know my political views. You have lived in the USA for twenty years, are married to an American and have two children. The USA has become your home. Might that change for you under Donald Trump? I hope not. But I am concerned about the great tensions and divisions going on within society. For the first time I have had the experience of school classmates of my children referring to me as a “Nazi mother”. When the entry ban was adopted I was actually afraid that because of my green card, I would soon not be allowed back into the country. Fortunately, the situation has eased since the entry ban was stopped. But at the present time it is not a good feeling to be a foreigner living in America. German-American friendship is still being affirmed – at least on the German side. Are you afraid that this might change? Many people followed the visit of Angel Merkel to Washington and were annoyed that Donald Trump did not shake hands with the German Chancellor. The majority of Americans are interested in strengthening the longstanding partnership. In that respect of course I hope that diplomatic relations between the USA and Germany will improve. And also, of course, that the strong social commitment to helping refugees and the disadvantaged in Germany will continue to set an example for people in America. The UCC is afraid of big cutbacks in social provision under the Presidency of Donald Trump. What can the churches do against this? The churches in America take on many of the social tasks that are the responsibility of the State in Germany. Almost every church has its own social priority. We are involved, for example, in the public schools and we offer free midday meals for children from socially deprived families during school terms and also during the summer holidays. Other UCC churches, such as our neighbouring church in Columbus are very involved with homelessness. Mostly we work ecumenically with other churches, as well as with the local community. If public money for social work – which is very little in comparison to Germany – is withdrawn, then we have a real fear of an ever-widening social gap in the USA. The UCC has already called for demonstrations, has organised petitions and is taking a public position. That is the most we can do for the moment.